The indomitable West Indies held on to become the first world champions in a Lord’s thriller which had the crowd on the edge of their seats until a quarter to nine. Windies skipper and man of the match Clive Lloyd led by example with a thunderous knock of 102 to set the Aussies a stiff target of 292. Australia did not hold back as they raced along to 81 for one in reply, but then spectacularly contributed to their own downfall with five run-outs. Jeff Thomson and Dennis Lillee revived hopes with a last-wicket stand of 41, but inevitably poor running ended their resistance with eight balls remaining. India dethroned back-to-back champions and red-hot favourites West Indies with a stunning fightback in a low-scoring encounter. India had seemed down and out in a predictable-looking final as they were bowled out for just 183. It was not the lowest winning total in a Lord’s final, but it looked highly inadequate against the Windies' formidable batting line-up. Viv Richards looked well in control, but became the first of three quick Madan Lal victims as the West Indies dramatically slumped to 66 for six. Jeff Dujon and Malcolm Marshall threatened to turn things around, but the underdogs had the bit between their teeth and man of the match Mohinder Amarnath removed them both to spark off Indian celebrations. Victory over New Zealand in a high-scoring quarter-final, followed by a long journey to north India looked to have taken its toll on Australia, as the West Indies, rejuvenated after a shock loss to Kenya, closed in on a place in the final. The Aussies slipped to 16 for four and although they recovered to set a target of 208, the Windies looked to have the measure of the task. Richie Richardson and Shivnarine Chanderpaul were in complete control until the latter's dismissal sparked a dramatic collapse of eight quick wickets. Richardson could still have won the game with 10 needed in the last over, but instead of giving his captain the strike, last man Courtney Walsh aimed a wild heave and was bowled. Sri Lanka sensationally rewrote the world order with some outstanding performances in 1996 and their success was made all the sweeter by the fact Australia were their final victims. The Aussies had refused to play in Sri Lanka earlier in the tournament due to terrorist fears and the islanders were offended. They responded by sweeping to the final on a wave of exhilarating and fearless cricket, but when they lost two early wickets, including man of the moment Sanath Jayasuriya, in response to Australia's 241, the entertainment seemed over. Aravinda de Silva had different ideas, however, and ruthlessly punished an increasingly frustrated Australian attack to win the match with a majestic unbeaten 107. Australia bt South Africa on net run-rate after match finished tied. The most dramatic finish in the history of one-day cricket saw eventual champions Australia scrape through to the final on net run-rate after both sides had been bowled out for the same score. The Aussies' dramatic late charge through the tournament looked over as Lance Klusener bludgeoned his way to 31 in balls to all but tilt a seesaw match decisively in South Africa's favour. Klusner levelled the scores at 213 in the final over, but a rush of blood resulted in Allan Donald being run out with two balls to spare. It was the World Cup's first-ever tie and apart from the sensational finish it was littered with fine performances on both sides. Never one to hang around, Lloyd virtually won the first World Cup for the West Indies with an innings of breathtaking power. The Windies skipper was dropped on 26, but made the most of the chance as he blasted his way to a jaw-dropping century in 82 balls. The great Viv Richards took the World Cup away from England with a stupendous knock to rescue the West Indies from 99 for four. Richards changed the game in a devastating partnership with Collis King. He finished in style by swatting the last ball of the innings for six. Australia faced elimination from the World Cup until Waugh, with a little help from Herschelle Gibbs, turned things around with an innings of characteristic determination. Waugh was only 56 when dropped by a prematurely celebrating Gibbs, who had earlier hit a hundred himself. Whether Waugh really told Gibbs he had ‘dropped the World Cup’ or not, he had. The sides met again in the semi-finals and the rest is history. De Silva played the innings of his life to lead Sri Lanka to a glorious World Cup triumph in a grudge final against Australia. Chief destroyer Sanath Jayasuriya had departed early, but de Silva picked up the baton with a masterful knock which wonderfully epitomised the flair with which Sri Lanka took the event by storm. Eventual winners India almost missed out on a semi-final spot as minnows Zimbabwe threatened an upset by reducing them to 17 for five. Skipper Kapil turned things around, however, with an electrifying, and then record, knock which included 16 fours and six sixes. India went on to win by 31 runs. Young all-rounder Gilmour came out of the blue to take Australia close to unexpected glory in the inaugural World Cup. Gilmour, who had not played in any of the group games, came into the side to take six for 14 and 28 not out against England in the semi-finals. He was not done there either, and claimed another five for 48 in the final, but the West Indies held on to win. Lancashire opener 'Foxy' Fowler proved reliable throughout the 1983 tournament, hitting four successive scores of 69 or more to lead England to the last four. His top score was his 81 not out against Pakistan, but he could manage only 33 as England went out to India in the semi-finals. Sri Lanka may still have been international minnows, but they did enough in 1983 to prove they were no longer lightweight opposition. In de Mel, they also looked to have found a penetrative opening bowler. De Mel took wickets in every game, the highlights being successive five-wicket hauls in a narrow loss to Pakistan and three-wicket win over New Zealand. Zimbabwe may not have pulled up many trees after opening the tournament with a shock defeat of Australia, but in Curran they proved they had international-quality performers. Curran proved plenty of useful lower-order runs, including 73 against India and 62 against the West Indies, and chipped in with the odd wicket. He continued to perform with distinction on the county circuit for Northamptonshire and Gloucestershire. Allott would not have been expected by many to finish as the tournament's most prolific bowler, but after a series of consistent performances, he ended up joint-top wicket-taker with Shane Warne. The Kiwi left-armer proved a revelation, particularly in the early games, and finished with 20 wickets, his best analysis being four for 37 against Australia. Fast bowlers are never more deadly than when angry, and by the time Jeff Thomson arrived in London, he was absolutely fuming. Stung by the criticism of his constant overstepping during Australia’s previous match, Thomson was determined to let rip, and poor old Wettimuny bore the brunt of his anger. Thomson first put Duleep Mendis in St Thomas’ Hospital by hitting him on the head with a bouncer then got to work on Wettimuny. The Sri Lankan opener withstood several blows to the body and Thomson unsportingly and dramatically tried to run him out as he hopped around after being struck on the foot. He battled on to a game 51, but eventually had to call it a day and join Mendis in the accident and emergency ward after the ball hit him on the same battered foot for a second time. The right of Pakistan to reach the final of a World Cup they were co-hosting and for Imran Khan to retire in a blaze of glory had barely been questioned. What the Pakistani team and 40,000 passionate fans had reckoned without was Allan Border, who put one over his opposite number by leading his unheralded side to a surprise win. The Aussies started well before slipping to 155 for three. Border and Mike Veletta recovered with a dogged stand before Imran hit back with three late wickets as Australia scored 267. Three early wickets saw Pakistan’s reply begin disastrously, but Imran cracked 58 in a 112-run stand with Javed Miandad (70) to throw the game back into balance. It was Border who made the crucial breakthrough, having Imran caught on the boundary to turn the game Australia’s way. It was not the way Imran planned to retire, and he soon returned. Australia had just one match to play in New Zealand during the World Cup and after this disastrous trip to Eden Park, it was probably just as well. Border travelled across the Tasman with a side brimming with confidence under the tag of being the tournament favourites, but the underdog had its day in a dramatic opening to the competition. Border was completely outsmarted and outplayed by his Kiwi counterpart, a man not fully fit and whose captaincy had been the subject of much criticism. Crowe first defied the Aussies with a brilliant unbeaten 100, playing much of it on one leg to protect a knee injury. He then dumfounded the Australians by opening the bowling with Chris Cairns and spinner Dipak Patel in what was probably the slowest attack in world cricket. He then mixed in plenty of medium pacers in one and two-over spells and denied the Aussies the chance of reaching their target. This childish skirmish between Pakistani wicketkeeper Moin and Australian tail-ender Whitney is perhaps the nearest thing to fisticuffs the World Cup has ever seen. It came towards the end of another ill-tempered encounter between these two fiercely competitive sides. Whitney had enjoyed little luck with the ball and as Australia collapsed towards defeat, Moin’s constant chattering obviously irked. The pair had to be separated by Bruce Reid and umpire Piloo Reporter as the exchange threatened to become even more heated. 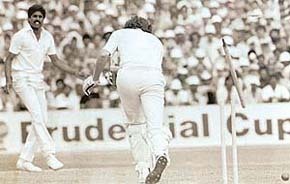 Wasim Akram resolved the problem by bowling Whitney to wrap up the game soon after. The match proved pivotal to Pakistan’s at that point faltering campaign and Imran Khan’s ‘cornered tigers’ went on to win the tournament. The rivalry between Australia and Sri Lanka was there for all to see when Ranatunga strode out to bat and was met by a hostile Warne glare in the 1996 final. The Aussies had rubbed the tropical islanders the wrong way during the tournament and prior to the game, Ranatunga fanned the flames by intimating that their golden boy was overrated. Warne was into his last over when the Sri Lankan skipper came in and although the hard work had been done, Ranatunga showed no remorse, clobbering his first ball through the bowler’s fingers for four and whipping the next for six to the delight of the crowd. He poked his tongue out for good measure. Called into the side as soon as Australia saw the green and over-watered Headingley wicket that later attracted much criticism, left-arm swing bowler Gilmour ended England's World Cup hopes. He dismissed six of England's top seven as they slumped to 93 all out, then followed up with 28 not out as the Aussies scraped through. Geoff Boycott and Mike Brearley's pedestrian 37-over, 129-run opening stand meant England were always behind the clock chasing 287. Nevertheless, at 183 for two they were still in contention until the Big Bird began a spell of five for four in 11 balls by clean bowling Graham Gooch, David Gower and Wayne Larkins in the same over. McDermott helped Australia tear up the World Cup script with a man of the match as they successfully defended 267. Wasim Akram tried to increase the run rate after a poor start, but McDermott responded to being hit for six with a leg stump yorker. It was his second victim of the day and three more followed as he wrapped up the tail. Neil Fairbrother and Allan Lamb had revived England's World Cup dream after the mesmeric Mushtaq Ahmed had pinned down their top order. But that was all to change as Wasim returned to break the 72-run partnership with a jaffa which comprehensively accounted for Lamb's stump. He followed up by bowling Chris Lewis next ball to all, but secure the cup for Pakistan. This rollercoaster of a game may ultimately be remembered for the comic tragedy of Allan Donald's run out, yet before Lance Klusener all but won the game for South Africa, Warne had put the Aussies firmly in control. His ‘ball from hell mark two' removed Herschelle Gibbs and fellow opener Gary Kirsten was bowled next over. 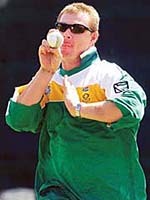 He proved almost impossible to score off and his later dismissals of Hansie Cronje and the dangerous Jacques Kallis gave him four of the top five. India’s disastrous World Cup campaign ended ignominiously as they lost their third consecutive game, this time to a side still two years short of gaining Test status. In a game spread over two days as Manchester’s weather lived up to its reputation, Sri Lanka laid down the challenge by posting a well-constructed 238 for five. Sidath Wettimuny, Roy Dias and Man of the Match Duleep Mendis all scored half centuries. In reply, India made a positive start, reaching 119 for two, but fell away badly to collapse to 191 all out and return home with their tail between their legs. The World Cup began with a bang as Zimbabwe produced one of the greatest shocks of modern cricket. Under the astute guidance of captain Duncan Fletcher, Zimbabwe proved that on their day they could live with the best as they humbled the Aussies in a game which on paper had looked as one-sided as they come. Fletcher led by example for the Africans, surviving two scares to hit an unbeaten 69 in his side’s respectable 239 for six. Kepler Wessels and Rodney Marsh both hit half-centuries in reply, but Australia could not keep up with the rate as they were strangled by Zimbabwe’s efficiency in the field. Fletcher’s four for 42 made him Man of the Match. Since the inception of one-day cricket, India had provided pretty much lightweight opposition. 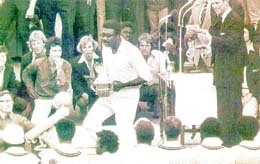 They arrived in England with just one World Cup win to their name and that had come two tournaments previously against minnows East Africa in 1975. Although they pulled off a surprise group win over the West Indies in difficult conditions at Old Trafford, their progress in 1983 was again pretty unspectacular. They almost lost to Zimbabwe, but suddenly, unexpected wins over Australia and England took them through to the final. It was a true David vs Goliath confrontation and after India’s 183, the giants looked certain to win. Complacency set in, however, and India’s brilliant fielding and tight bowling, epitomised by Madan Lal’s three for 12, came out on top. February 29 comes round once every four years, results like this once a lifetime. A united West Indies side would surely have swept Kenya away, but this was no such team. They had sulked their way around the subcontinent, refusing to play in Sri Lanka and criticising each other in the Press. This was their lowest point. They were sloppy and petulant on the field, dropping catches and conceding numerous extras, but they should still have surpassed Kenya’s 166. Yet their response was reckless and they slumped to 93 all out. Kenya’s delight was perfectly encapsulated when wicketkeeper Tariq Iqbal, after a momentary fumble, gleefully held on to an edge from the careless Brian Lara and celebrated wildly as the magnitude of the achievement began to sink in. Quite how Asian minnows Bangladesh managed to overturn odds of 33-1 to beat one of the tournament favourites, a side with four wins from their previous four games, has been the subject of scrutiny ever since it happened. The ease and surprise with which the eventual finalists were beaten led to suggestions of match-fixing which refuse to go away. Yet it may just have been one of those days. Wasim Akram, Shoaib Akhtar and Waqar Younis all beat the bat often enough without luck as Bangladesh posted 223. Khaled Mahmud then removed Shahid Afridi with his fifth ball and went on to have a day he will never forget, claiming three for 31 as Pakistan slumped to 161 all out.